FORT MYERS, Fla --- Alex Scherff’s first full professional season had its ups and downs. The 2017 fifth-round pick initially struggled in an aggressive assignment to Low A Greenville. But after a rough April in which he allowed 19 runs, 18 earned, in 17 1/3 innings over four starts, walking 13 while recording just 11 strikeouts, he righted the ship in May and early June, posting a more palatable 2.60 ERA in six starts, striking out 24 and walking 8 in 27 2/3. His momentum was halted by an intercostal strain that kept him out almost two months, but after his return on August 8, the right-hander excelled for the rest of the season. After two rehab appearances in the Gulf Coast League, he returned to the Drive and made four starts, Allowing just 3 runs in 18 innings, striking out 16 while walking just two. 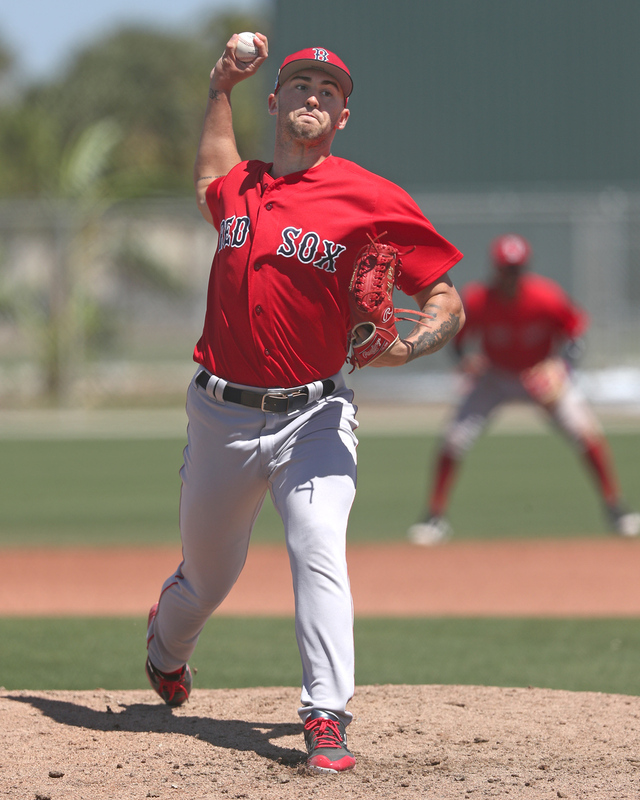 Looking to build on his strong return from injury, Scherff got the start in the Red Sox Fall Instructional League opener against the Orioles minor leaguers and threw three innings. He got into some trouble in the first inning, but fared better in the next two innings. In the outing, he allowed three hits while walking one and hitting one batter, recording two strikeouts and inducing four swinging strikes. The first thing that stands out about Scherff is his upper body. He has a lot of muscle and very long arms. He’s clearly very strong and has a filled-out frame with minimal projection remaining. It is all the more impressive considering he dropped 40 pounds between his sophomore and junior years of high school—it is clear he has continued to work hard on maintaining his body. Scherff seems to have returned to the delivery he used in high school after tinkering with his mechanics last year. He throws from a high three-quarters arm slot with a stiff, arm-heavy delivery. He throws very upright and doesn’t get great extension or incorporate his lower half. In this outing, he struggled to repeat his delivery and as a result struggled to command his fastball. Scherff does have a very strong arm, and even with those concerns about his delivery his fastball sat 92-94 mph. The pitch was on the straight side, but did get a pair of swinging strikes and both strikeouts. With improved consistency, the pitch looks like a potential plus offering. Scherff’s curveball was his primary secondary pitch, flashing above-average potential. The pitch comes in at 75-77 mph with long, 12-to-6 break. He clearly has confidence in it, showing a willingness to throw the pitch in any count and to hitters on both sides of the plate. Scherff also showed a changeup at 81-83 mph. The pitch was inconsistent in this outing, showing drop on occasion but little movement on others. Overall, it seemed like a potential fringe-average to average pitch, surprising given that it was supposed to be the better of his off-speed pitches as an amateur. This look at Scherff was an improvement from my look at him in Spring Training, but whether he can stick in the rotation long-term is still to be determined. He’ll continue to be developed as a starter in order to continue to work on his secondaries and fastball command, but his delivery looks like one that would play better out of the bullpen.